Just south of Leblon, not so very far away from the center of Rio de Janeiro, on a mountain side overlooking the Atlantic Ocean lies a spectacular park. Mauro Quintanilha started to clean the site near the favela of Vidigal around 2006 when he became extremely frustrated with the smell, the sight and the whole idea of having a garbage dump next door. He and his neighbors successfully removed 16 tons of trash over a period of six years. Some days he worked alone, other days there were other people to help. After some years Mauro started to plant trees. He went to the Botanical Gardens and got seedlings there. Planting shrubs and trees seemed to be the best way to prevent others from building houses. The park grew during the years from 1500 m2 to 8500 m2. Mauro and his friends also started to reuse the materials they found to build walls and other structures. In the course of the years two landscape architects, one from the USA and another one local, but both Harvard Design School graduates, Pedro Henrique de Cristo and Caroline Shannon started to help Mauro to structure the process and communicate it to a much larger public. In this way one of the most fascinating parks in the world appeared: Sitié park in Vidigal, Rio de Janeiro. During my last stay in Rio de Janeiro in November 2014 I attended a conference on parks that was held in the Botanical Gardens of the city. The conference, organized by a non for profit called Arq Futuro discussed the future of urban parks in Brazil. It is a subject that interests me quite a lot so I was very glad to attend. One of the presentations was done by Mauro Quintanilha, assisted by Pedro and Caroline. It was overwhelming and hearth breaking. This is exactly what is needed today. Forget about big master plans and long discussions. What we all like to see is immediate action. But on the other hand these bottom-up approaches can be very frustrating, time consuming and terribly out of date. The combination of a good strategy and a plan together with the urgency of a locally based initiative offers the best possibility to produce the good projects. The combination of the local initiative with the academic knowledge. This could certainly be one. I discussed my enthusiasm with Juliana Luna. She is the local guide that I met through the help of the Dutch Consulate in Rio de Janeiro. I am not afraid to visit the favela, but combined with my bad performance in the Portuguese language I wanted to convince her to join me to go there. I didn’t need much convincing: she wanted to see the park as well so the trek was planned for the next Sunday morning. Visiting a site like Sitie is not just the easy thing to do, getting on a bus and walk a little. We had to take a metro and after that the taxi. Lucky enough the cab driver was born in the favela and had no objection at all to drive us up there. The road was blocked with a garbage collecting truck. I considered that as a good sign because in years past these kind of services would not be found in a favela. Further uphill we had to change to motor taxis. Another fantastic initiative where local drivers take you on the back of their motorcycle up and down the mountain. The park was easily found. Sitie park is located between the favela of Vidigal and the Atlantic Ocean. Till the mid eighties it was just Atlantic forest, when six families started to invade the space and built houses there. The city tore their houses down in 2003 but did not take away the debris. 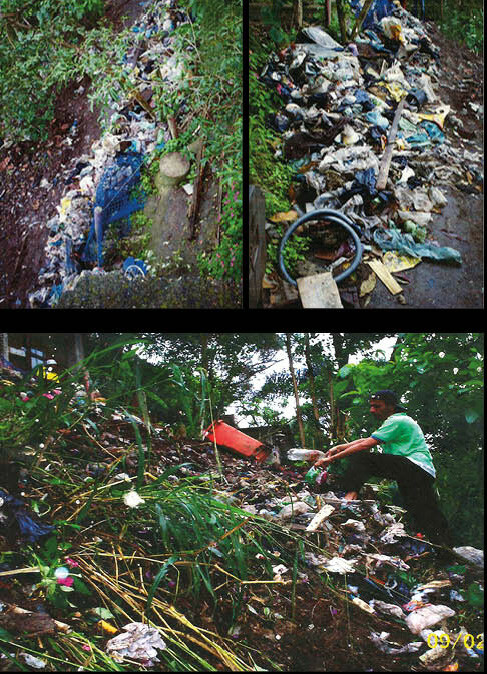 The area became a dumping site and during the years more than 16 tons of garbage were accumulated. The garbage that Mauro and his friends in the later years had to take away. 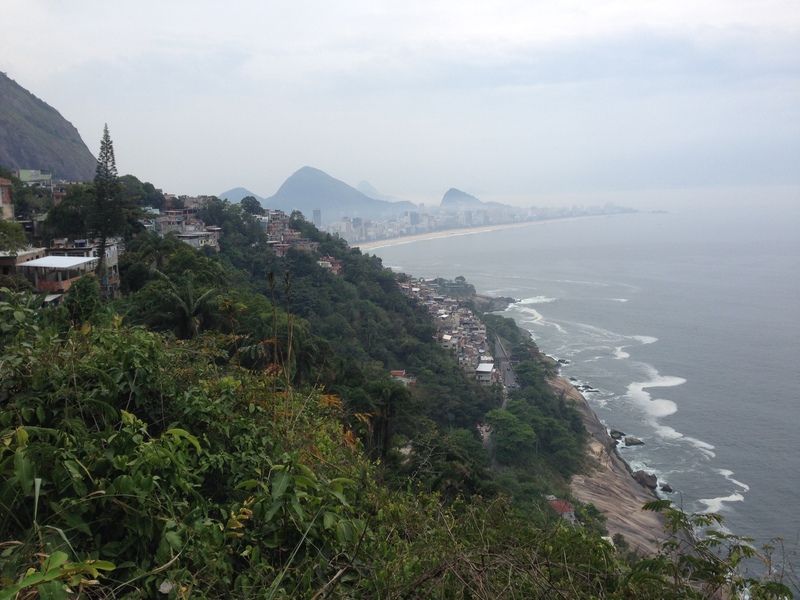 Vidigal hosts around 25.000 inhabitants, on the slopes of the Two Brothers Mountains (Dois Irmaõs), directly overlooking the Atlantic Ocean just South of Ipanema. 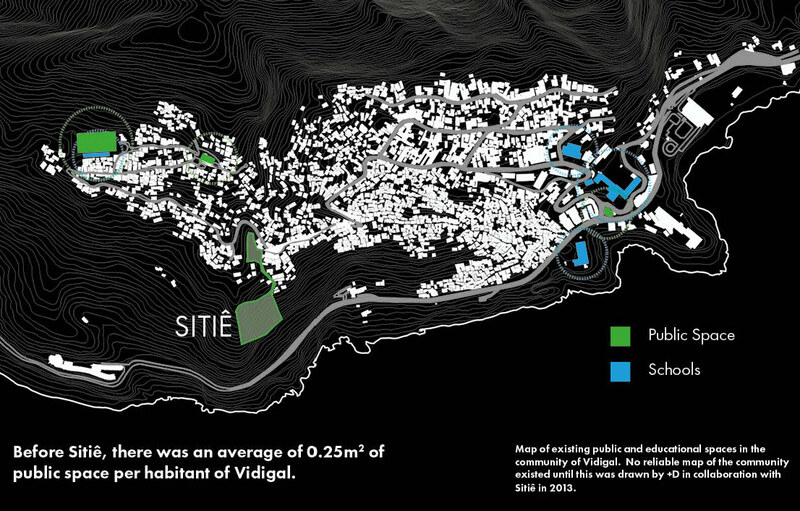 The favela has an enormous density with something like 6200 inhabitants or more per square kilometer and with an extreme lack of public space. The favela was founded somewhere in the early fifties, grew during the seventies and eighties. It became subject to narco-traffic in the eighties and was “pacified” in 2012. Today there is a continuous police presence (which has undoubtedly made it safer) but there is a lack of functioning infrastructure and opportunities, a lot of poverty and violence. We walked through the park on a misty Sunday morning. Juliana couldn’t stop talking to Mauro, him telling her all the stories of the park in progress. The view is amazing, the planting makes the place even more special. The park offers plenty of possibilities for people to meet. The park hosts community meetings, offers a lot of activities for kids. Favelas are most of the time constructed on the least desirable terrain. The views may be spectacular but the mountain here is very steep. One of the very interesting aspects will be if the construction of retaining walls using the tires filled with concrete and sand will be able to stop erosion. The tires are also used to construct stairs in order to make the park accessible for the elderly, for children and for pregnant women. On the back of the motor taxis we drive to the top of the hill. The views are again spectacular. We have been told that some local restaurants and hostels can be found in this area. There are some, nicely painted, but they are not opened yet. Sleepy faces looking over the balcony is all we get to see. The party will probably have ended late yesterday. It’s easy to understand that more people start to get interested in these locations. Creating a fantastic park, bringing in hostels, restaurants and parties can have a positive effect on the area. The more people bringing their money into the favela the better the opportunities for the inhabitants to create a better life will be. Gentrification is a real treat here. The World Cup and the Olympics are bringing a lot of attention to beautiful Rio de Janeiro. The pressure is getting bigger because of the lack of public space. This park will no doubt be a big success and bring thousands of people here in the future. The real challenge is to secure the long time residents, the people that have lived there for more than 20 years, to be able to stay in their homes and invest in their businesses. Lets all invest in the favela. They are places of opportunities and hope.